Ok, I am new to this but I got my order from Geoswag(oakcoins) and there was this cool little coin in the package that I didn't order. It doesn't have a tracking number, just has 1 OakBucks on it, a website that does not seem to exist, and an expiration date of Dec. 08. It's a really cool little coin, almost wish it had a tracking number so others could see it as a geocoin. if you want it to travel around you could attach it to a Tb tag. but it may "get lost"
Could it have been a pathtag? It sounds like a promotional marketing item...I mean the extra little coin thingy. Ok, I am new to this but I got my order from Geoswag(oakcoins) and there was this cool little coin in the package that I didn't order. It doesn't have a tracking number, just has 1 OakBucks on it, a website that does not seem to exist, and an expiration date of Dec. 08. It's a really cool little coin, almost with it had a tracking number so others could see it as a geocoin. Shoot an email to oakcoins and ask them. It probably gets you some sort of discount on reorders. You might want to try posting in the "Geocoin Discussions" forum. Could you post a picture of it? Sounds like an advertisement coin of some kind. I once found a coin called Woodworkers Warehouse that was a bit bigger than the USA geocoin. I also found some military 'challenge' coins. I just received a package of four geocoins I'd ordered from OakCoins. I found one of these OakBucks coins in the package. Whatever it is, mine also expires "Dec-08". On the other side of the coin, there's a Web address of www.oakbucks.com, but that URL doesn't work for me, either. I assume it's part of an upcoming promotion of some sort. 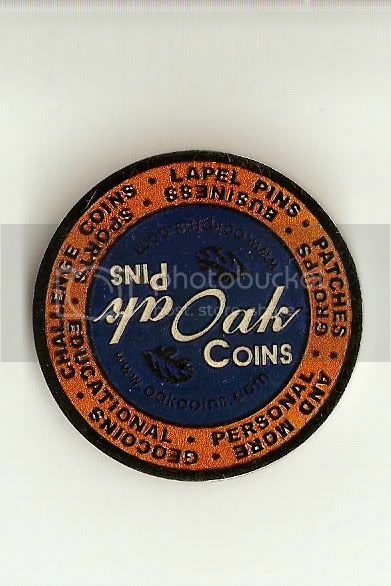 The Oakbucks can be collected and used to "buy" geocaching products at any of the events Oakcoins attends in 2008. We are still working on getting the website up and running, so there will be more info to come. Not sure if I want to trade it in though as it's a cool little coin. I got 4 oakbucks today and thought to myself that these might be marketing tools to get me to purchase more geocoins! Oh, this is good to know. We ordered some items for a recent event, and one of these came with our oakcoins order. We'll never be in a position to use it, so we'll have to figure out what to do with it now. If I went to a bank and gave the teller an Oakbuck and asked for change, would she give me twenty wooden nickels? We found one of these once. It's from the same company, I guess. Both pictures are the same coin, front and back. Well, the URL is working now. It looks like oakcoins will release more information in the new year. I too received one of these coins with an order. I received 5 geocoins as a Christmas gift and it came with this really cool non trackable Oak Bucks coin. From what it appears to be is a promotional item that can be exchanged for cash on another purchase. It has a #1 on it, but if it's only worth a dollar, I would much rather just keep the coin. 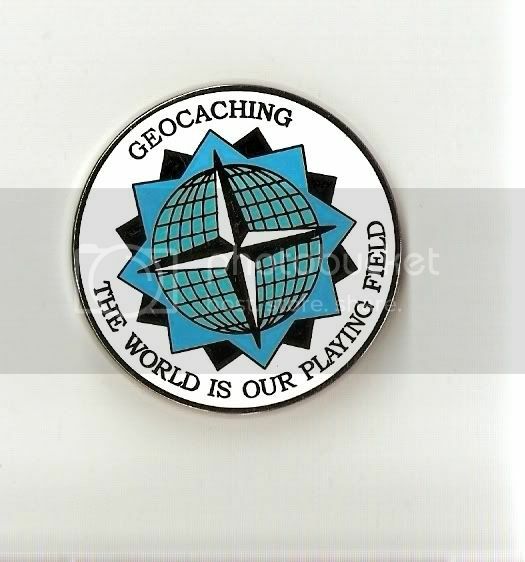 I'm pretty sure that somebody on the Geocoin forums could clarify this dilemma. Finally found additional information pertaining to Oak Bucks. Check out the Oak Bucks link and it will give you more info on this subject. Those are way too cool to let go of for face value, if that's meant to be taken literally. Won't most people just keep them? A new cache popped up close to me a week ago and I went out hoping for FTF. One of the items inside was a $1 OakBuck in a little pouch that said "For FTF". Well I was 4th to find and figured that it had been over looked by the first 3 finders. I thought it was an unactivated geocoin so I grabbed it. After finding out what it really was I realized that I'm not going to be able to use it so I dropped it in a new cache that I set out a few days ago.